Derry City's Rory Patterson has left the club. Picture by Ed Scannell. Striker Rory Patterson has left Derry City. The Strabane man, who confirmed the news on his official twitter account that his contract with the Candystripes was cancelled, was the Brandywell men’s top scorer last season. 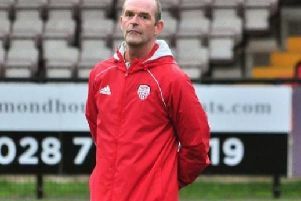 Pre-season gets underway tomorrow and boss Peter Hutton will now need to step up his search for Patterson’s replacement. Hutton also confirmed that if the striker signed for a club in the UK or Ireland then City would be looking for compensation. “Derry City FC would like to thank Rory Patterson for his commitment and service during his time with the club.